I’ve been thinking about writing this blog for a while. A Mother’s Day blog. I’ve written and deleted sentences in my head. I’ve opened and closed Word. I’ve scrolled every single social media site… again, and again… and again. I’ve searched my past blogs for things I’ve written before, wondering if past-me had any words of wisdom past that I could use (she didn’t). It’s now the day before Mother’s Day and I’m yet to put pen to paper (or fingers to keyboard). The words aren’t coming this year. On the surface of it – Mum’s dead. It’s crap. What more is there to say? But I think those surface thoughts are just masking the fact that I do have things to say. I have so much to say and I know this because if I didn’t, I wouldn’t have this feeling that I need to blog. The problem is, the words are stuck. They’re joining the feelings in a place so squashed and so buried that I can’t access them. It’s like when you have a bin, but the weather is grim so you don’t want to go outside and empty it. Instead, you squish down the stuff inside it to get more in so that you can hold off taking it outside for another day or two. But the weather doesn’t pick up for a while, so you keep squishing it down and shoving more in, until the day comes when you do want to empty it but you can’t, because everything’s stuck. I don’t actually mind Mother’s Day itself. In some ways, it’s quite nice. Social media is filled with people celebrating their Mum’s, Grandma’s, and honorary Mum’s, and it can be really nice to see that. It’s a welcome break from the sheer number of depressing and frustrating news stories that often occupy my feeds. I think the thing I find difficult is the expectation that I won’t be okay. That it will (and should) be difficult. Some of this expectation comes from others. The posts on social media entitled ‘for those of you without Mum’s this Mother’s Day’, or ‘for those of you grieving’, or something like that. The tweets with helpline numbers. The kind and thoughtful messages from friends and family members letting me know that they’re thinking of me (thank you, lovely people!). All are very well-meaning, but all are a reminder that while others can take their Mum out for a nice lunch, or buy them a box of chocolates, the life-to-death postal service isn’t currently in operation, so I can’t do those things. Some of the ‘you should feel rubbish’ expectation comes from myself. I almost feel like if I don’t struggle with Mother’s Day, then it means that Mum wasn’t as much of a Mum as she might have been. It’s stupid, because how I feel or don’t feel on Mothering Sunday or any other Sunday of the year has no bearing on what Mum meant to me, how Mum was as a Mum, or anything much else related to our relationship. Tomorrow is just another day. It’s 24 hours and it will pass just like every other 24 hours does. I won’t be buying any chocolates, sending a card, or going out for any meals. I’ll remember Mum, I’m sure. But I remember Mum every single day, because she was a big part of my life for 21 years, and has continued to be part of my life since she died. To those of us who do find Mother’s Day difficult, please try and up the self-care a little bit. To those of us who don’t have a Mum we can take out, but aren’t really struggling with the fact it’s Mother’s Day – please remember that it’s okay. It’s okay to feel okay. (It’s okay not to feel okay). To everyone else – celebrate your Mum. Give her a hug. Send her a happy text. Have a lovely Sunday. Whilst walking to an appointment today, I was wondering why the ‘I need my mum [insert tears here]’ feelings had been stirring again over the last few days. Part of it is the state of my life right now. But then I realised that today marks four years since I found out that Mum had a terminal diagnosis. One day. One conversation. One car journey. My life hasn’t been the same ever since. ‘Diagnosis day’ was a weird one. I was volunteering in Leeds (following a very early morning). Dad text me asking me where I was, which was weird, because I was at uni so he no longer ever needed to know where I was. He drove over, picked me up, and told me while he was driving. I looked out of the window. I didn’t want him to see me cry. We got home and didn’t talk about it. 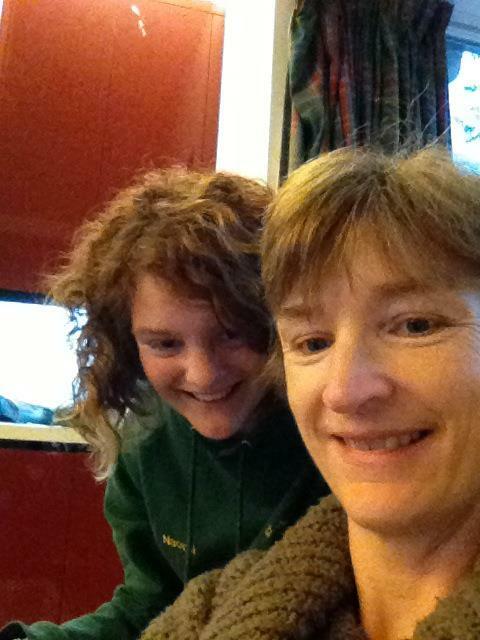 Mum and I took a selfie. I went back to uni later that afternoon. My grief started that day. It’s a difficult one to articulate. How can you grieve for a person who’s still there? How can you grieve for your old life, when nothing’s really changed (yet)? The only thing that’s changed is that you’ve received a new piece of information. Everything else is the same. But you do start grieving. In and amongst all the oh-my-goodness-shock-confusion-trying-to-work-it-all-out, there’s grief. It’s been four years, but it’s something I’ve struggled to come to terms with. That is until I started listening to The Grief Cast podcast lately. Many episodes have people who describe their grief starting while their loved one was still alive. It’s helped me realise that it’s okay. It’s okay that my grief began that day. I’m not alone. From the moment you find out that your loved one is dying, everything changes. I mean everything. The solid foundation of ‘Mum will always be there’ disappears from beneath your feet. You become more careless with money (can’t take it with you when you’re dead). Assignments feel pointless. Relationships develop new importance. Jobs can feel worthless. Sleep can go out of whack. Food can go a bit wonky. Every time your phone rings, you’re convinced that someone else you love is dying or has died. Your anxiety can skyrocket. You start crying at random objects. Everything changes. You become a member of a club you never wanted to be in. Grief begins. You grieve your old carefree life. You wish that the most important thing on your mind was still what to wear for a Friday night out. You begin to miss the person your loved one was, as you watch them fade away in front of your eyes. You watch your family change, too. Morphing into a different family from the one you grew up with, as everyone tries to work out how best to cope. You spend night after night mulling things over, crying, getting angry and bargaining with the unknown. Later on you begin to wish that your loved one would die. You can’t stand seeing them so unwell, and your life is on hold until the point of death. Then you feel guilty and angry at yourself for feeling that way. Grief is well and truly present. We need to move away from the assumption that we can only grieve once a person is dead. We need to move away from the stereotype that grief is a whole load of crying for a while, then it’s finished and you move on. It’s damaging to have these stereotypes because it makes it so much harder when you do have to experience the reality of grief. It can also cause people to react to our grief in insensitive (and sometimes bizarre) ways. Grief is ugly. Grief is painful. Grief is messy. Grief is unpredictable. Grief can come in waves. Grief can rear it’s ugly head unexpectedly. Grief doesn’t have a nice, neat, end point. Grief is a life-long experience that affects us from the moment it begins. And that beginning is the moment our life changes. Not necessarily the moment when person dies. One of the couple of selfies I’ve found that we took that day. Featured on Huffington Post here. I can’t quite believe it’s been two years since Mum died. In some ways, her death feels like it happened yesterday. In many ways, it feels as though it happened a lifetime ago. Is it getting easier? Maybe. I’ve always believed that you don’t get over grief, you get along with it. You rub along with it as best you can. Two years on and I still hold this belief. I’m not over grief, I haven’t come through it, but I’m learning to live life alongside it. I no longer burst into tears when I see a Mum-aged person chomping on a cheese straw. Or when I see a cancer-ridden-body making their way around the supermarket. The grief attacks are becoming further apart. There aren’t as many times that I pick up my phone to text or call Mum, before remembering I can’t. But that doesn’t mean it’s gone away. I still cried when I found out that Dad had donated one of her favourite Christmas cookbooks to a charity shop (thankfully I have a wonderful auntie who replaced it within a week – queue more tears!). I still sobbed when I had some significant health challenges recently and wanted nothing more than a Mum hug. I still struggled when faced with a stranger receiving a cancer diagnosis right in front of me. Mum hasn’t disappeared from my life. She has become part of it. She’s part of the Christmas cake I baked a few weeks ago. She’s part of the bread I’ve made the last few weeks. She’s part of the birthday food package delivered to my brother. I see her in the crunchy leaves – remembering walks we had and the time we played football one October half term. I hear her steady advice in my ear when I’m faced with horrible life challenges. I feel how proud she is, through the pride I feel for my brothers and all they are achieving. Life changed when Mum was diagnosed. In some ways, the five years since her original diagnosis have been the worst five years of my life. However, they’ve also been the best five years. I’ve become closer with my brothers. My life has been propelled in a completely different direction – but despite the agonising decisions at times, I firmly believe that it was the right thing. I’ve met some amazing people. I’ve inherited many Mum figures. My outlook on life has changed. I have fallen back in love with art. I’ve been through tears, sobs, sleepless nights, medications, therapy, major health challenges, jobs, houses, flatmates, long phone calls, dog walks, driving tests, exams, panic attacks, laughter… the list goes on. I’ve learned what’s important. I’ve learned how much I love my family, but that they’re not always right. I’ve learned that family aren’t necessarily those you’re related to. I’ve learned that I am stronger than I ever imagined – however much I don’t believe it at times. I’ve learned that crying is okay. I’ve learned that people can be amazing. I’ve learned that some people are not amazing, and you have to let them go. I’ve learned that it’s okay to let people in. I’ve learned that every emotion is okay, you just have to learn how to manage them. I’ve learned that you have to do a job that makes you happy, even if it doesn’t pay as well as other jobs, or doesn’t live up to other’s expectations. And that’s only the start. A year ago, we started fundraising for Martin House Children’s Hospice in Mum’s memory, as she used to work there. I am delighted to say that a year on we have absolutely smashed the target (it doesn’t all show on Just Giving as some donations went straight to the hospice). The money was originally going on lighting, but due to planning changes we have had a bit of a change of plan. It’s now going towards a music, art, and animation suite which is so perfect. Mum brought joy to many people’s lives and hopefully this room will bring joy to the lives of many young people on their families. 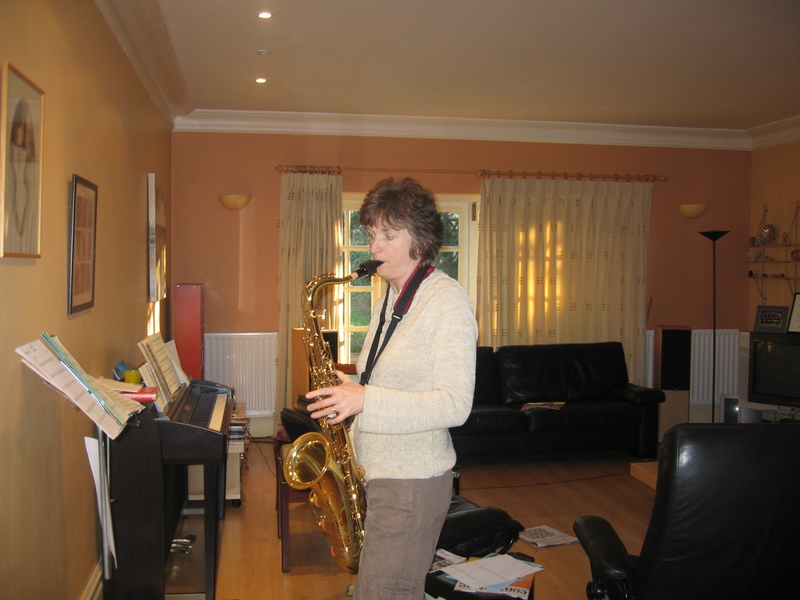 Mum was also a saxophone (foghorn) player and loved music. We would often dance around the kitchen to various CDs and blast them out in the car whilst we sang along. We want to say a HUGE thank you to everyone who has helped us to reach this target – and there have been a lot of you! It was a fun thing to do, and a lovely way to remember Mum, and now she can live on through this room and all that it will provide.